ALLEN career institute students bags 2 Gold Medals for the Country in Asian Physics Olympiad 2018 held from 5 to 12 May 2018 in Hanoi, Vietnam. 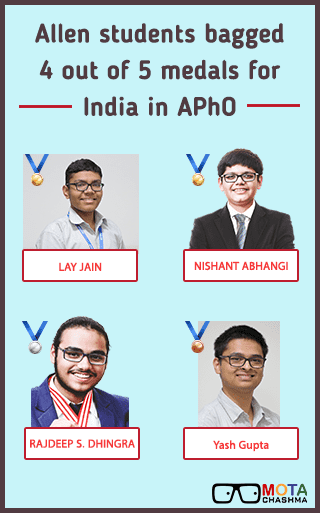 185 contestants from 25 nations and regions had participated in the 19th edition of Asian Physics Olympiad (APhO), where India clinched a total of 5 medals including 2 Gold, 1 Silver and 2 Bronze. Further, four out of 5 medals were bagged by the students of Allen Career Institute. A proud moment for the country as the number of awards received this year has been increased. Last year, India settled with a single gold medal which was received by Debaditya Pramanik, however, this year, India finished with two gold medals received by Lay Jain and Nishant Abhangi, students of Allen Career Institute. 20th Asian Physics Olympiad 2019 will be held in Australia. Scroll down to read in details. India won 5 medals in 19th Asian Physics Olympiad 2018. Students of Allen Career Institute received four out of 5 medals, including 2 gold, 1 silver and 1 bronze. India was one of the nine countries winning gold medals along with China, Russia, Taiwan, Rumania, Vietnam, Singapore, Kazakhstan, and Hong Kong. A total of 33 golds, 13 silvers, 24 bronzes, and 9 special awards for individuals distributed for the outstanding performance of the participants. Director of Allen Career Institute, Brajesh Maheshwari proudly announced that students of the ALLEN Career Institute's classroom program have made this achievement. Lay Jain and Nishant Abhangi received Gold Medal. Rajdeep Dhingra received the Silver Medal and Yash Gupta got Bronze Medal. He further added, "The examination was conducted in five stages, where Students of ALLEN Career Institute made the country proud". The final round was held at the University of Science and Technology, Hanoi. It is worth noting that Lay Jain and Yash Gupta have also shown outstanding performance in JEE Main 2018 result. At the time of JEE Main 2018 result, both the students were in Vietnam. Lay Jain got AIR-13 in JEE Main and Yash Gupta got AIR-19 in the same.